Onsite SEO – you’ve probably heard the term but now it’s time for me to really open up my SEO toolbox and give those of you who read this the not-so-secret secret sauce for onsite SEO, or, at least how I do my onsite SEO. It all starts with a target keyword. In the graphic below the keyword is “first words” and, as the graphic shows, first words are important for onsite SEO. Let this be one of the key takeaways you get – always ensure that your keywords appear towards the start of your title, description, etc in your post as that way you’re making it easier for search engines to crawl them and get a better idea of what your post is about. And, before writing a post, always have a good idea as to what your main keyword is so that you can naturally drop it, or secondary keywords, into your blog post. Page URL – when you are saving or publishing your post make sure you include your keyword in the URL somewhere, preferably towards the start of the URL. Page SEO Title – if you’re using the Yoast SEO Plugin you can easily edit and amend the SEO title of your post. The SEO title is what appears in the top of the browswer bar and also appears as the title of the post when being shared via social media. As this is the title of the post try make it interesting to get some us human folk interested in reading it – catering to Google is well and good but don’t forget your readers. Meta Description – is what appears in the search results and as snippets when your post is shared via social media. The meta description is your chance to entice readers into click on your post but also serves as useful onsite SEO retail – make sure your keyword is included somewhere in it but also try include a hook and a call to action to get users to click. Make use of H2 and H3 tags in your onsite SEO efforts to repeat your keyword in as many different tags as possible. Well, maybe not as many as possible – you don’t want to go overboard, just do it naturally. Once you have a focus in mind for a blog post using the keyword naturally in other tags becomes easy. No blog post is complete without an image or two and no onsite SEO is complete without a keyword in the alt tag of an image. Another thing I like to do is actually name the file my_chosen_keyword.jpg as well as giving adding the alt tag – just to given a stronger signal to Google again. I like to try link out to at least one authoritative site in each post and ideally the authoritative site I’m linking to should be authority on the topic I’m writing about. I like to think of it somewhat as “guilty by association” – as in, if I’m linking to authoritative sites then eventually Google may view your site as authoritative. How long this may take I’m not to sure but what I am sure about is that you don’t want to link to spammy sites, that’s like lobbing a live hand grenade into onsite SEO efforts, no bueno. Categories and tags, whilst not vital for SEO, can serve a useful purpose for user experience and for organising your data. The only issue with categories and tags are the duplicate content that can be produced by some CMS so if using make sure to 301 redirect duplicates. I like to keep the use of tags and categories to a minimum. And there you have it my guide to onsite SEO. Ultimately, when writing blog posts, keep the overall objective of giving the search engines a strong sense of what the page is about in mind. Search engines are only machines like and so will parse and understand posts based on what they find in key spots on your blog post. By ensuring that they see your keyword in a variety of places then you are making it easier for them to pick up the topic of the site and laying down the best SEO foundations you can for your posts to be found in the search engines. The above is what I apply to pretty much all of my blog posts so if you want to get an idea as to how you can apply this to your own posts I suggest you read more of my posts ;) It’s crucial that if you’re using the Yoast SEO plugin that you don’t get blinded by the green lights but instead understand how each of the onsite SEO elements relate to each other and how you can use them to improve your sites SEO. Do you have any onsite SEO tips to share – I’d love to hear so please, comment below! If you enjoyed this post check out some of my other big reads and join the mailing list below to make sure you don’t miss out on future big reads! I’m also on a mission on Google Plus – so, check that out and circle me! 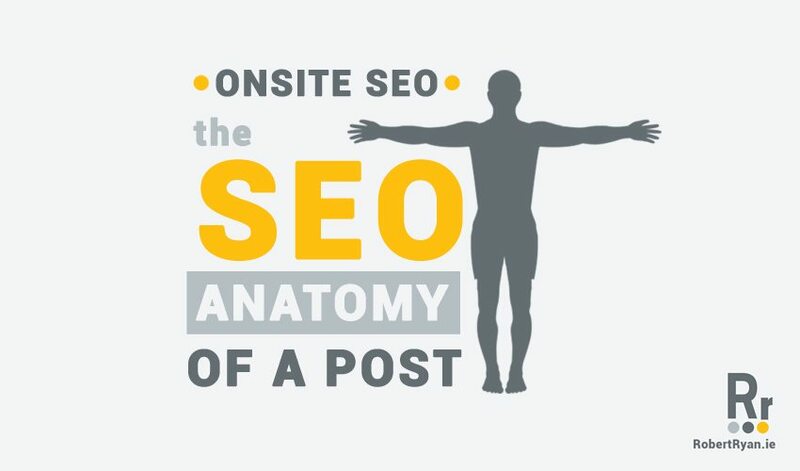 19 Replies to "Onsite SEO - The SEO Anatomy of a Blog Post"
Hi John – you can change your keyword on a post but it could be a zero sum game. If it’s an old post and not highly trafficked then the search engines might not detect any changes and if it has well trafficked then why change? As for tinkering being accepted or rejected by search engines it would all depend on the type of tinkering I suppose. Feel free to contact me with a link to your site and what you want to achieve and we can take it from there.. Cheers..
Nice post Robert. I’m going to add this into my next read up list. I’ll give you a nudge when it’s published. Lovely stuff, thanks Stuart, appreciate it..
You’re very welcome Chantal, glad you like liked it..
As usual, great post you have mate! I think you nailed it a lot especially with meta description. Really wonder if this is worth it (many discussions that meta desc is dead) but I always believe it is still good to practise it. Heh! Have a great weekend! Awesome post! I have the Yoast SEO Plugin, but wasn’t really sure what I was doing. I just played with stuff until I got a lot of green. Thanks for explaining this so eloquently. I feel like I’m finally starting to understand a small portion of SEO.